Thinking about selling your home or property? Wondering what your home is worth? I would be happy to help you and provide you with my over a quater century of expereince in real estate sales experience, with no pressure and no commitment. The articles and resources on this page are complimentary and only a small part of the many services I offer. If you would like to request an online home evaluation, known as a Comparative market Analysis or CMA, please fill out the form below. All information you provide is secure and will be kept strictly confidential. Please see our page The Townsend Real Estate Difference under the Local Information section on the main page. 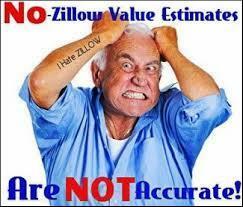 Zillow has been in the news lately about the law suits against them for their "alledged" habit of severely under pricing home values. As a rule, all online home value estimate algorithims are defective and cannot compare with an experienced real estate agent's ability to value property by doing a full Comparative Market Analysis (CMA) on your home or property. If you would like a fast and more accurate estimation of your homes value then use Realtor.com's home estimating tool. From my own experience their algorithm is slightly better at giving you a closer approximation of your homes value for the market it is in. As always though, do not rely on these estimates in selecting a sales price for your home or property. Only a qualified and licensed real estate agent/broker or appraiser can do so.